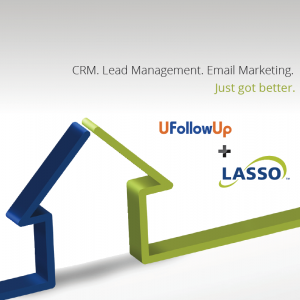 VANCOUVER, BC (November 6, 2012) – Lasso Data Systems, North America’s leading developer of CRM homebuilder software, today announced its plans to acquire UFollowUp, a Washington, DC-based provider of builder sales technology solutions. The acquisition joins the intellectual capital, technology and clientele of two industry leading CRM homebuilder software providers under Lasso Data Systems, which serves builders, developers and sales agencies throughout the United States and Canada. As part of the acquisition, the combined company will be headquartered in Vancouver, Canada and will be led by CEO Dave Clements. UFollowUp’s current principal, Marc Regardie, will take on the role of Vice President, Eastern Region to be based in Washington, DC. Regardie will oversee existing customer relationships and new client acquisitions in the region. “Bringing the UFollowUp team and expertise together with Lasso Data Systems creates an enhanced organization with an even stronger means for helping homebuilders, multifamily real estate developers and new home agencies across the continent to achieve faster, easier sales and improved profitability,” said Marc Regardie. “I am thrilled to join the Lasso team, whose dedication to the highest standard of client service align exactly with what we have done over the last eight years,” added Regardie. Lasso CRM marketing and sales software is geared toward builders that develop and sell new residential construction or market multifamily rental properties. The software differs from other available solutions in that Lasso CRM is designed specifically for frontline marketing and sales personnel, where competing systems are typically construction management focused tools with CRM as an add-on component. Lasso CRM equips customers to sell faster and easier by improving lead capture, prospect management, sales velocity, close ratios and marketing ROI. The solution also assists in improving the effectiveness and efficiency of builder administration and operations. Customers access Lasso via the web 24/7 from anywhere and subscribe as part of a monthly software-as-a-service (SaaS). Commonly referred to as cloud computing, the subscription requires minimal upfront set-up and training, as well as no need for IT investment. According to the 2011 National Association of Realtors (NAR) study, 90% of homebuyers first use the Internet in their search for a new home. “With the Internet now an integral part of the home buying experience, builders must be equipped with a CRM solution that best captures and converts leads,” added Clements. View a PDF of the release here.